So I was searching if a topic like this already existed and while I found some were you could show your bonkle collection I wondered....why not all your LEGO collection? So here you may post your display of your whole collection. Here are some pics of my displays and collection, sorry for not the best camera quality, but anyway enjoy! Not all of my collection is here since I'm moving soon, but you get the idea. I don't really have a LEGO display. I mean I have a desk where I pose them and make some fun thingareenies occasionally but usually they're scattered about or neatly posed in a tight corner. I see, I used to do that when I was younger, but as a gift my grandparents gave me those shelves so I could put them in in a much nicer way, I will probably buy more at my new house cause at the moment half of my stuff is in boxes. 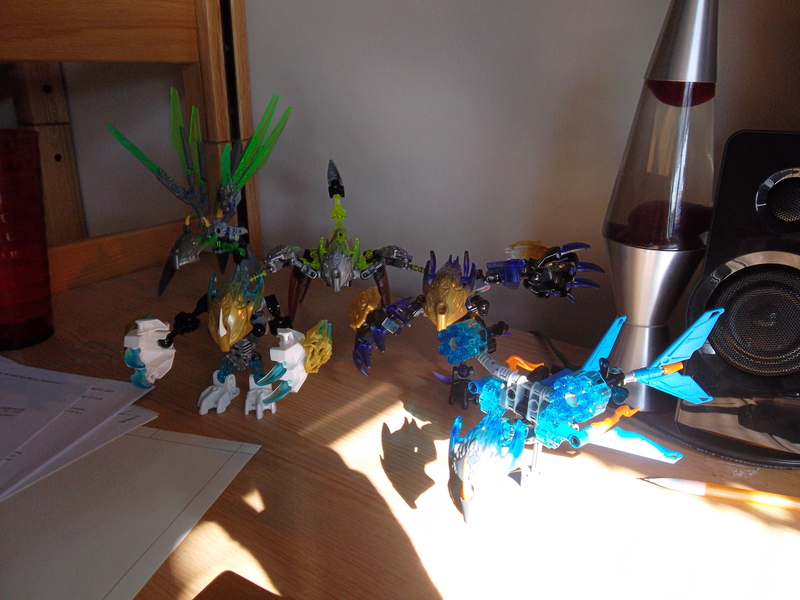 It would be a shelf with kopaka and a dead pohatu and tahu. I put more effort on my Transformers Shelf, to be honest. It's more in the closet, desktop, dressertop, bottom drawer of the dresser, and cabinet than it is in the display case. Mostly on the desktop because I built a cameraman who I thought needed to film something interesting. Then there is cluster**** that is the G2 shelf, where some sets had to be clumped together for the sake of space and others (mainly Skull Scorpio because he takes up ALOT of space) had to be slightly taken apart. Wow, these all look cool. I wish I had shelves. I have a whole bookshelf behind my computer desk where I arrange my sets based on the year and brand. I got the 2015 heroes shelf, 2015 skull villain shelf, Star Wars constraction shelf, super hero ultra-build shelf, moc shelf, 2016 hero shelf, and then a shelf with umarak until the 2016 villain wave comes out, I'm kind of a neat freak when it comes to my bionicle sets lol. 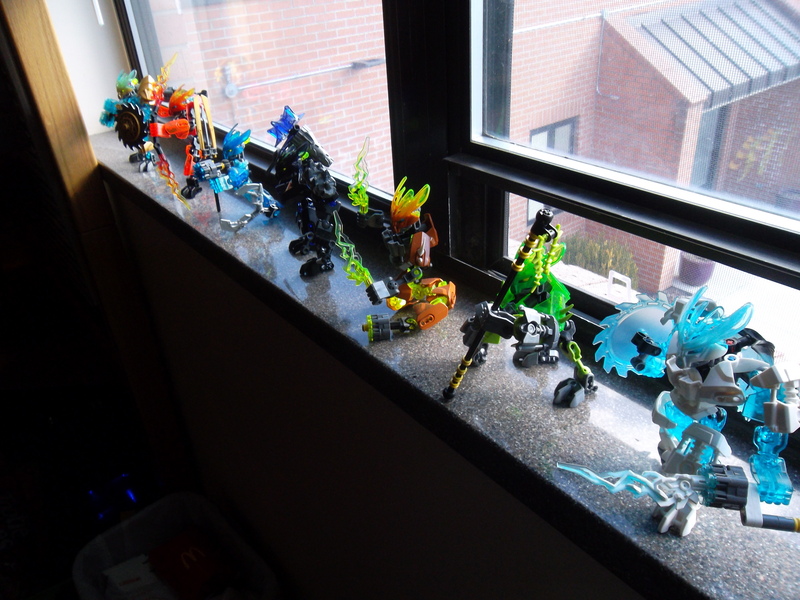 I put most of my bonkles in boxes, but generally I have some small system builds/sets on windowsills and mantles n that. To take a picture of my collection would be like throwing a camera into a parts bin. Because that's really all that's left of it. I don't know why, but Torts is my favorite Mixel and to honor his awesomeness, he's gettin' arrested by the ADU. While it isn't the most flashy thing in the world, I just wanted a nice place for a couple of my Space Figs to get together. A Pteranodon and a Spoopy Boo Fig in the Ol' West. Sounds Legit. In case you didn't know, Sharkmen LOVE Ferris Wheels. ...and some assorted G1 & G2 goodness on the wardrobe. And Grievous, because Grievous. This is a brilliant idea. 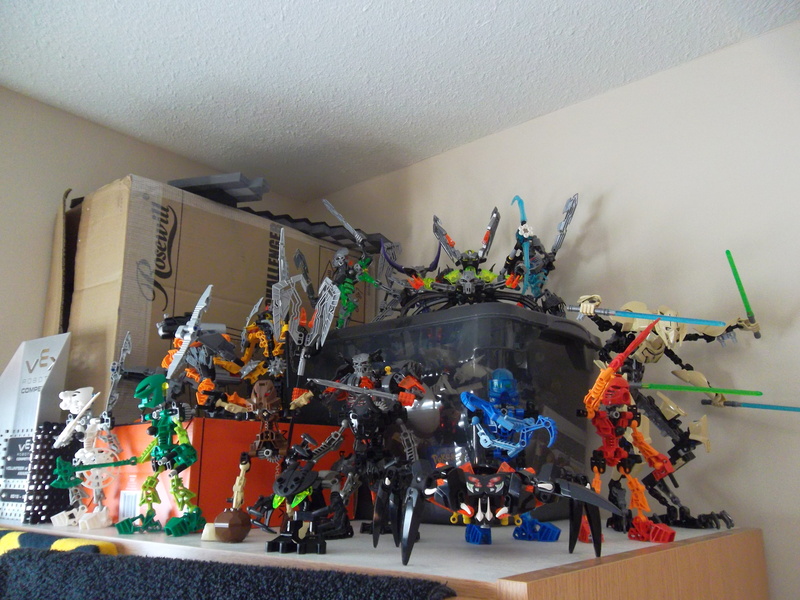 It's a great way to save space, display a Toa team together, and give them all really cool poses. I myself don't really have a display of my sets. They are mostly just scattered around my LEGO room. I got a job and bought them myself. Would be lying to you if I said that my dad doesn't over spoil me.